Marianna Massey/Getty ImagesRory McIlroy celebrates after hitting a birdie at the 18th hole and winning at the Arnold Palmer Invitational. Rory McIlroy expressed his belief that tour events should consider limiting the sale of alcohol after interactions with unruly fans during his win at the Arnold Palmer Invitational over the weekend. Rambunctious fandom in golf has been on the rise, with some tournaments embracing the cheers and jeers from the crowd to set themselves apart from golf’s usually quiet moods. Fans should be less of an issue in McIlroy’s upcoming schedule, with the Masters Tournament just a few weeks away. Rory McIlroy won the Arnold Palmer Invitational on Sunday, posting a remarkable -18 on the weekend to finish three strokes ahead of his closest competitor. 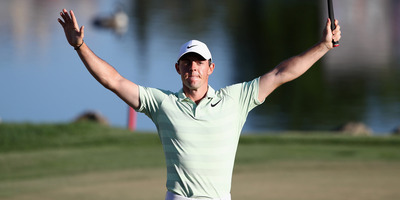 But while McIlroy was undoubtedly happy to end his 18-month drought of taking down a tournament, he didn’t leave the event entirely pleased, having taken issue with some fans who got a bit too unruly, especially one fan who continued to yell out McIlroy’s wife’s name. McIlroy’s solution to the issue? Keep fans less inebriated. It’s not the first time McIlroy has had problems with rowdy fans. At the 2016 Ryder Cup, American fans heckled McIlroy and his teammates incessantly at Hazeltine National Golf Club as the Americans took home the trophy. Additionally, some tournaments – namely the Phoenix Open – have encouraged a bit more spirit from its fans, embracing loud cheers and jeers as long a player isn’t in the middle of its backswing. While some see the development as essential to the growth of golf, some golfers find it distressing, McIlroy among them. Thankfully, McIlroy shouldn’t have an issue with the crowd at his upcoming events – the Masters Tournament is just a few weeks away, and unruly fans likely won’t last long at Augusta.